Reported on Infowars: "Approximately 20 killed and 42 injured after a gunman opened fire and took hostages at a gay nightclub in Orlando, Florida, police said early Sunday." The death toll has since been revised to 50, making this the worst mass-shooting in US history. 3. Venus indirectly quincunx Pluto and ruled Mercury which is sesquiquadrate Pluto. 5. Sun widely quincunx Pluto and ruled Mercury which is sesquiquadrate Pluto. 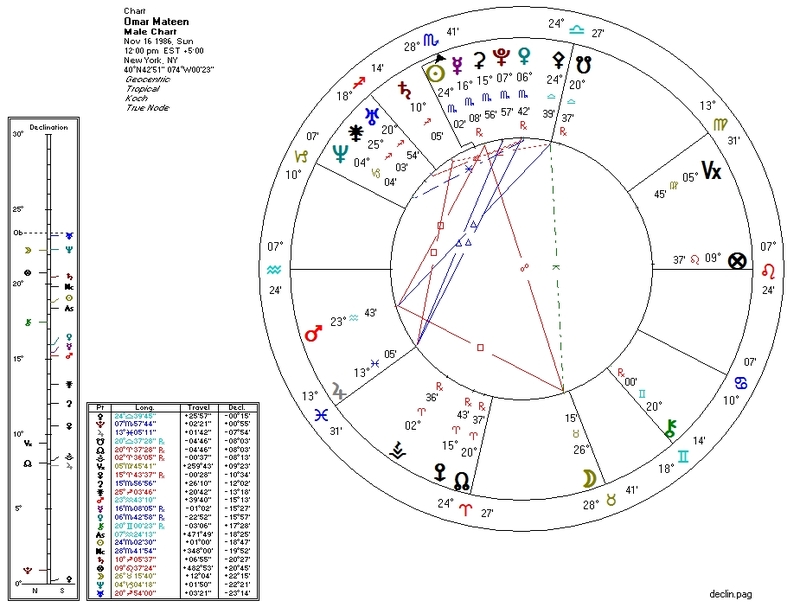 The yod pitting Mars in Scorpio against Uranus and Venus hints at deadly violence against those who "love differently". 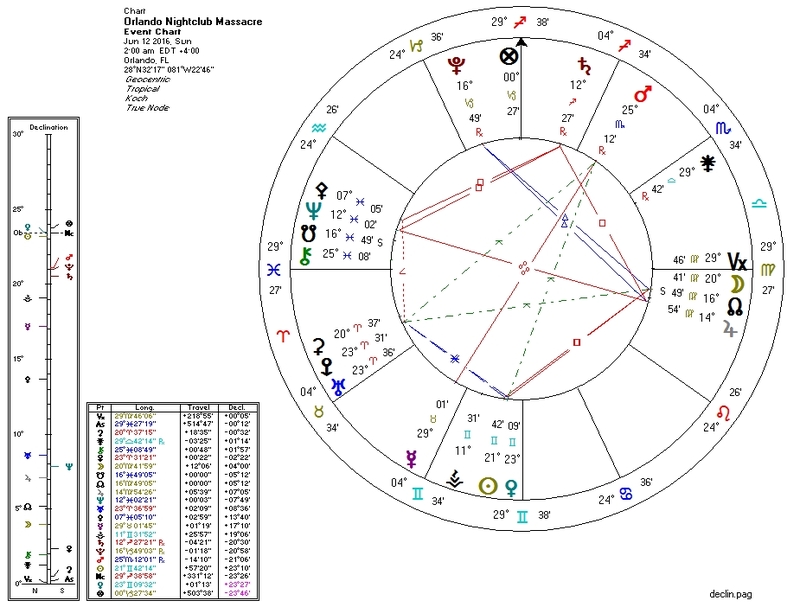 Against the horoscope of the state of Florida, we have not the usual transiting Pluto against natal Pallas but transiting Jupiter sesquiquadrate Florida's Pallas. This suggests bad behavior not for its own sake but for some sort of cause. The suspected perpetrator, Omar Mateen, an Islamic Afgani-American, Wackenhut employee, and registered Democrat (apparently also aligned with ISIS), likely has the Bloodbath Formula in his horoscope. 1. Pallas conjunct South Node and ruled by Venus which is conjunct Pluto. 4. Moon probably ruled by Venus which is conjunct Pluto; Moon possibly quindecile Pluto. Transiting Pluto at 16 Capricorn is widely square Mateen's Pallas at 24 Libra. Had one or more nightclub patrons or bouncers been armed, this night might have gone much differently. In Florida, bars are "gun free zones".